The smallest of the DMP line, the new DMP Flex 100 is designed as the entry point to 3D printed metal manufacturing of small, complex fine detail metal parts at high quality using Direct Metal Printing (DMP). 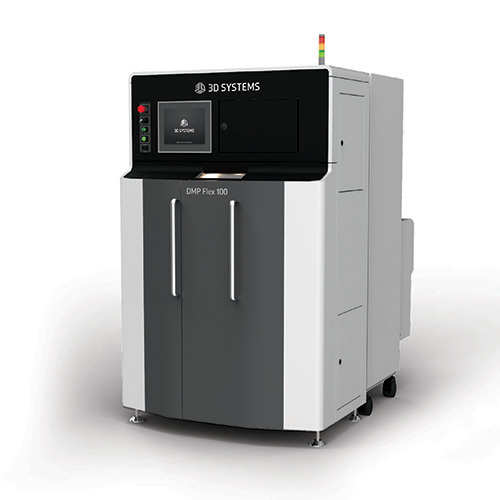 DMP Flex 100 solution features a build volume of 100 x 100 x 80 mm (3.94 x 3.94 x 3.15 in), a 100W laser, 3DXpert™ all-in-one software solution for metal additive manufacturing and a portfolio of qualified LaserForm® metal powders. The DMP Flex 100 offers the flexibility of manual material loading and an optional, atmospheric controlled, external recycling station.